How will your band divide up the song writing credit? Writing credits are always an important issue for bands and can be divided in many different ways, for example some bands choose to split credit evenly amongst all members of the band, while others meticulously map who wrote what and go based off percentage of contribution. Additionally some bands will have an actively involved producer make the final decision and this might be smart to avoid a stalemate. However you decide you want to do it, a band agreement clarifying this point will avoid arguments and potential litigation if you have a successful song and members of the band want to know where the money is. Don’t let your big moment turn into you big headache, settle these issues ahead of time and get them put down in writing. When you’re a new band your intellectual property may seem like nothing. You are probably more concerned with the value of your instruments or buying a tour van that breaks down less than once per week. However once your band has achieved some level of success your IP may well become the most valuable thing that you own. So it is important to decide who will own what in the event that the group dissolves or members change over. IP includes more than you may think, things like the band name, artwork, designs, and even signature pieces (think the KISS makeup or Slipknot’s masks) are all Intellectual Property that has real value and that everyone involved in your band may want a piece of. However do you really want there to be two other bands touring under the same name after you kick out your rhythm section? A band agreement can spell out who owns what and who has the right to use what and when. This section of the agreement can be especially important because this area has been ripe for costly litigation over and over again with many famous examples (The Misfits, Great White, Queensrÿche, YES, etc). So while your band may never write a punk record as iconic as “Walk Among Us”, you could easily write an agreement that avoids many of the issues that The Misfits have faced over the years. As an ancillary benefit, this section of the agreement can also designate who is a key member and who is not for things like touring purposes. So maybe it’s ok to find a fill-in drummer, but designating that the main songwriter and singer must be on every tour can preserve your bands reputation and integrity. In this hustle-based economy where a bands revenue can come from a myriad of sources it is important to determine who gets what piece of what pie. This can be more complicated than it may appear on the surface. And not only should you decide who is getting what now, but also in the future. And it is also important to plan for the contingency that your bandmates today may not be your same bandmates tomorrow, and the former ones may still feel entitled to some of the money the band is generating (potentially under the theory that it was their genius that propelled the band to where it is now). So a full band agreement should touch on all revenue streams for both today and tomorrow. Areas that should be addressed include but are not limited to, royalties, publishing, merch income, tour revenue, who owns instruments or gear acquired through endorsements (the band as an entity or the individual member), and also non tangible assets, social media accounts, mailing lists, websites, etc. Every band makes decisions, from where to go for lunch to whether to kick out the awful drummer or not. So it is important to spell out just how the big decisions in the band will be made. Simple majority, or must everyone agree? Or maybe a different formula for each issue? Some of the more important issues to discuss and agree on are things like; how can members be removed or added? Which tours are accepted? How will management/label negotiations go? Does anyone or everyone have veto power when it comes to songs to be released? Who has the power to bind other members of the group? [although legally speaking each member is an agent of the band as an entity and can bind the group, but a band agreement can specify how these decisions must be made and give the other members recourse if something goes wrong and they are improperly bound]. All of these and more can be set out in the band agreement. Not only can you avoid legal disputes this way, but you can greatly speed up the workflow of your band in the process. 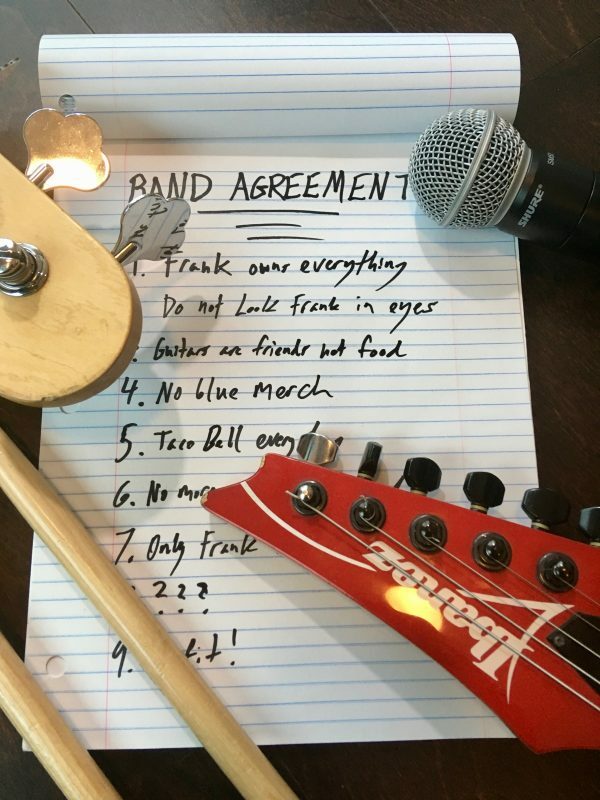 Recently I’ve been doing band agreements where there is a neutral third-party involved to settle certain disputes over decision making and so far the results have been extremely positive, so this is something else to consider for your agreement. So this all sounds good right? So what next? First, there is the DIY route where your band drafts your own agreement, and while I always recommend using an attorney for legal matters, for a very simple agreement you might be able to make it work on your own. There are plenty of templates online that you can use to get started with, but if you do choose to go this way I would highly advise still having your final draft looked over by an attorney before you sign it. I say this because I have yet to review a band drafted agreement that doesn’t have at least one very serious defect. There are many nuances to these agreements that no template can completely guide you through, so be careful because this will be a legally binding agreement and mistakes could be costly on the backend. Best case scenario though is hiring an entertainment lawyer to draft a fully customized agreement for your band. Lawyers aren’t necessarily cheap, but the expenses of an attorney drafted agreement is still a fraction of what you would spend in legal fees if there is even one serious dispute amongst the group. Many entertainment lawyers (myself included) will give you a free consultation so you can decide what is right for your situation and get an idea of what it will cost. A band agreement shouldn’t be scary and will be just the first of many contracts you will use in your long and successful music career.